It consists of 21 separate insulated panels that are connected together with threaded rods. The house can be assembled and reassembled easily in just one day. The blue space is for sleeping and is divided by a multifunctional partition that serves as shelves and an entrance to the bedroom. The white space serves as the day zone with multifunctional seats and a table. The red space appropriately contains the wood-burning stove and kitchenette. 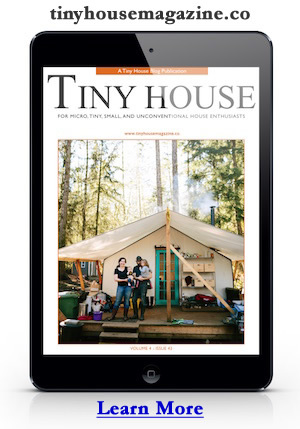 The folks at Pin-Up Houses have also published a new book, How to Build a Tiny House. Learn more about this innovate company at the Pin-Up Houses website. In this video they explain how the prefab house is assembled. Below you can see some detailed photos of the assembly. Here’s the finished house inside and out. Learn more at the Pin-Up Houses website. This entry was posted in Tiny House Projects and tagged experimental, france, Pin-up houses, prefabricated, tiny house. Derek & Hannah’s Tiny House is Done! Cost Just $34,667.23! Wow that looks so amazing, but how would it be for Ontario winters?? ?